Our disciples study will begin on Saturday, April 6 and every first Saturday of the month from 9-11am. This excellent study will greatly help your discernment as a disciple of Jesus Christ to learn how to KNOW and UNDERSTAND and DO God’s will in and for your life. I strongly urge you to participate with us. Workbook for the class are available from Pastor Tom ahead of time for a suggested donation of $20. Have you ever questioned whether or not you were following the will of God in your life? Have you gone down paths and made decisions that do not seem to fit with what you know deep inside should be your true walk with God? Do you desire to break out of the box you are in and serve God as an active disciple of Jesus Christ? Are you ready for adventure in life following the will of God the Father, through the guidance of the Holy Spirit, walking with Jesus day by day? 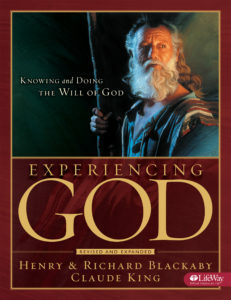 Since its release in 1990, God has used the Experiencing God: Knowing and Doing the Will of God study to change millions of lives and thousands of churches around the world. Ten years after its release, more than three million copies of the workbook had been distributed. The workbook has now been published in 47 languages and has been used in almost every denomination. So many lives have been radically changed: inmates, military personnel, lawyers, judges, CEOs, professional athletes, politicians, parents. The study has transformed thousands of churches, high schools, colleges, and seminaries. Because of this study, countless of people are now serving as missionaries, pastors, evangelists, and faithful servants.